La consentida de Doré is located in one of the best locations. You can hang out here before or after snacking at the mercado de Antón Martin or viewing classic movies at the 19th-century cinema Doré. It’s bar is placed towards the street, you are basically standing or sitting by the bar in the street. It’s perfect to enjoy Madrid’s warm weather, being outdoor and the noise of all the chatting. They offer all kind of beverages, but they specialise in beer. It’s the perfect place to get to learn about Spanish beers, as they have almost all the whole spectrum of Spanish beers. As for snacks, they have great “embutidos” (chorizo, ham…), but you should concentrate on their original variety of olives from around all parts of Spain. They’re really good quality olives! Not the ones they offer to you for free in any bar for having a beer. I guess they have this superb quality as they are located just beside the Antón Martin market. The staff and the people who come to this bar are also a great plus; the staff is open to any question, and without realizing it, I’ve ended up having casual conversations with strangers. 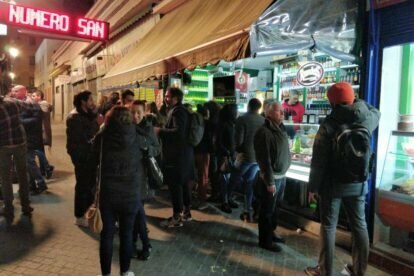 I would recommend going during nighttime, as Madrid’s climate during the night will guarantee you a warm feeling, and it’s the bars’ prime time. Any given day, people stay here until very late, as it seems for now there are not many neighbours complaining. Cheers and enjoy!